Fantasit Top Floor Unit In East Nashville! 1 Bed 1 / 0 Bath 979 Sq. ft. Description: Location*location*location! 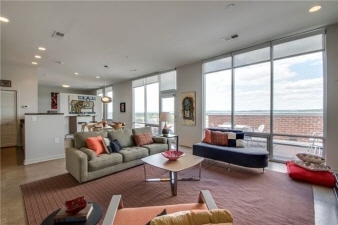 Only 2 blocks from 5 points* top floor unit w/10 ceilings*floor to ceiling windows in main living area*custom shades*cork flooring*granite countertops*stainless appliances*maple cabinetry*250 sq ft terrace w/great views! 1 beds 1 / 0 Bath 979 Sq. ft.